Vocabulary to language is like starch to a diet: an essential part that you can’t go without. One can get herself across without knowing all the grammatical rules. You will understand if somebody says: “I write good,” right? Even though the grammar of the sentence isn’t by the book, most listeners can work out what’s implied. On the contrary, you learn that in English you need to use an adverb not an adjective with most verbs. However, if you don’t know what is the adverb for “good,” you won’t be able to show off your knowledge of the rule. What I want to say with this simplified example is: learn as much vocabulary as you can. This Trello board can help you with that particular purpose. You want to learn and relearn new information repeatedly over a span of time. Studies, like this one, show that repetition helps putting new information into the long-term memory, a better way to learn than cramming, for example, 20 phrases a day and not doing any revision. Write down the meaning, either in the language you are learning or in your familiar language, in the description which you can refer whenever you fail to recall the meaning. Step 3: On Day 2, go back to the card, and make up a phrase with the word, move it to the Phrases list, and set a new due date for the next revision — Day 4, for example. Step 4: On Day 4, go back to the card, make up a sentence with the phrase, move it to the Sentence List, and set a new due date for the next revision —Day 7, for example. Step 5: On Day 7 (or the end of the week), go back to the card. Hopefully, by this time, you know the word in and out. If not, revise it once more time, then move the Week list. Learning a language is daunting as each skill, be it speaking, listening, reading, or writing requires different training and measurement. You prefer to have an interesting chat with others, but you also need to practice listening. Reading is a great way to enrich your vocabulary, but you also need to write to consolidate what you learn. It tends to be the case that you prefer one practice to others. I love to write, but I find talking to strangers exhausting. If I don’t get organised and force myself out of my comfort zone, I will keep writing and end up with being mediocre at conversing in the foreign language. If you have a similar problem, this Trello board will help! At the beginning of a week, or a day, fill the “To-Do” with cards, for example, “practice speaking and pronunciation with a mYngle tutor (check availability),” “read an article on a topic you are interested in,” “write another entry in your journal,” set a due date for each task, and turn on the notification. By the end of a week, revise things on “Done” and keep track of any tasks that are left undone. Pro-tip: Incorporate into this board tasks for skills that you want to focus on. If it’s speaking, one or two hours of weekly lessons on mYngle will enhance your learning considerably. Why do you learn a language? Everyone has an answer to this question. It could be to get a better job or to travel the world. However, not everyone has a good enough answer to help them succeed in mastering the language. In the international world economy, a new language skill, especially one like Mandarin or Spanish could open many doors in your career path. Such a target is great for morale but doesn’t give you the direction. You need to set goals, long-term as well as short-term. This Trello board is here to help you with just that. “Notes” & “Links” are for references that you use, such grammar forums, dictionaries, resources for reading and listening materials, forums to find language partners, etc. Remember that tracking the goals is important. You don’t have to accomplished everything, but you should be aware of your achievements as well as what you couldn’t do. 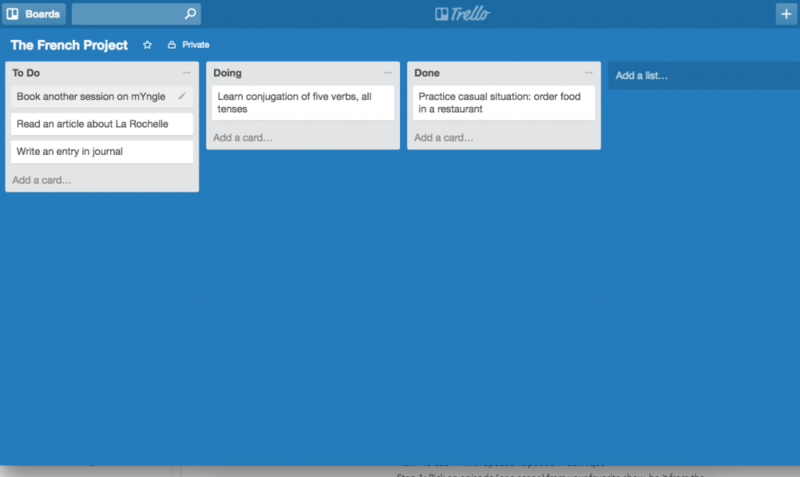 Trello offers the flexibility to keep track of your goals, tasks and whatever new things you learn. If you are already familiar with the tool, it becomes so easy to make language training a habit, get organised and progress. Subscribe to our blog Try mYngle now! 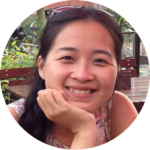 This entry was posted on Monday, June 26th, 2017 at 11:03 am	and is filed under Language Learning, Learning Languages. You can subscribe via RSS 2.0 feed to this post's comments. You can comment below, or link to this permanent URL from your own site. Your comments will appear immediately, but I reserve the right to delete innapropriate comments.